You'll fill someone's week with a burst cheerful sunshine when you send this brilliant bouquet of fresh blooming flowers. A contemporary vase holds an uplifting combination of colorful blossoms such as roses, spray roses, Asiatic lilies, alstroemeria, and more. Beautiful leafy greens add contrast to the bright yellow and peach tones. Measures approximately 11" x 13". Sunny Smiles Bouquet is a hand delivered gift. These gifts are delivered by one of our local design centers located throughout the United States and Canada. Same day delivery is available for most gifts when ordered before the cutoff time. The cutoff time for Sunny Smiles Bouquet is 2 PM in the recipient's time zone. On time and beautiful as advertised. The flowers that I ordered were absolutely beautiful and they were delivered within a few hours of placing my order! 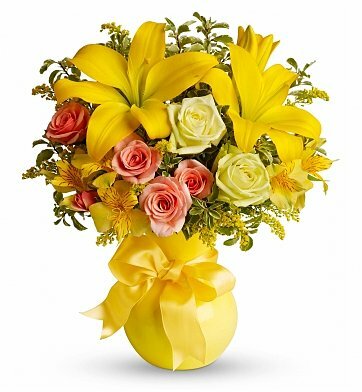 I ordered the Sunny Smiles Bouquet for my mother-in-law who lives in the Midwest. Because the December weather there is so cold and gray ,these flowers were the perfect thing to brighten up her birthday. She was so happy the flowers arrived fresh and the colors were so vibrant! I ordered this bouquet for my god-mother, and she loved it! I am happy with the product because she said it made her day!! My intent in sending flowers was to bring a small amount of joy to someone that is having a very difficult time. Her response was heartening...just knowing that someone was thinking of her. My wife Loved the flowers, It made her day! I sent this arrangement to my wife on her birthday. I don't normally send her flowers and I wanted to surprise her. She was actually having a bad day at her new job and she said that these were the prettiest and brightest flowers that I ever gave her. She absolutely LOVED THEM! The are still opening although some blooms have withered away, not bad for after a week! I've always been a procrastinator & waited until last minute to order flowers for my future mother-in-law for Mother's Day. I tried every online flower service there was and nobody that could deliver until the Monday after. I finally found this shop online. They also said delivery would be on Monday but had great reviews so I decided to go with them. Mother's Day comes and to our surprise the flowers were delivered to her that morning. We were very happy as the flower arrangement was absolutely beautiful and made her day. I would definitely recommend for anyone looking for a great company to send flowers. Not only did they give her the exact arrangement we paid for, service was beyond our expectations with the delivery being on Mother's Day. My friend who recently had hip replacement surgery said the flowers brightened the room and seriously made her feel better, just by looking at them. I sent this to a cancer patient and the person was happy. I just spoke to the person the flowers were sent to and they were very pleased - the flowers were beautiful. Thank you for a job well done. From what I saw of them, they were really pretty. Thanks. Couldn't have asked for better. The arrangement was beautiful, the timing was perfect (same day), status updates were helpful. The recipient was extremely happy with the beautiful bouquet. I sent this arrangement to my sister-in-law when she had minor one-day surgery. She so appreciated the thought and loved the flowers. They were delivered on time as scheduled. She sent me a photo, and her arrangement looked almost exactly like the one in the online photo. I was very pleased and so was she! It arrived on time... Beautiful and fresh flowers. My mother loved the Sunny Smiles Bouquet for Mother's day. I recommend this great gift for mothers or just to cheer someone up. My friend received the flowers on time and he LOOOOVED them. Great job!!! The flowers arrived the same day! My sister -in-law loved them, she said they were some of the prettiest flowers she had ever seen. I would highly recommend you service. Sent this to my Aunt ( get well ) and she absolutely loved it ! Excellent service ... gorgeous and fresh flowers ! Have ordered often to send to relatives and friends in the States. I live in Europe. The BEST ! The flowers were delivered out of my state, so I didn't see them, but the recipient said they were beautiful! My friend loved the fresh flowers delivered.. Amazing!!! Thanks to gifttree.. The recipient really loved the flowers and vase, the whole presentation. She said it was very cheery! I bought this for my mothers 89th birthday and she said it was absolutely beautiful and it must have cost meh alot of money. But it was very affordable and the service at Gift Tree was exceptional. I will be back! This was my second purchase from gift tree and once again I am completely satisfied. Everything was delivered quickly, the prices are great and from what I hear the flowers were beautiful. I would recommend to everyone! We have used GiftTree for fast and great gifts. The photos are very clear and the recipients typically always are thrilled to receive gifts, such as this floral arrangement. We bought this for a relative in the hospital and the choice was well received.